The helmet we made for our first NEMOSUIT was based on the graphic references we had available and, while it was the best we could do at the time, I’ll be the first to admit that, in retrospect, it wasn’t all it might have been. Our subsequent helmets are based on better information: including documentation made by Harper Goff himself to define the helmets used in the movie. Therefore, we dubbed this new line our “Honest To Goff” helmet series. Starting back in 2003, our NAUTILUS DIVER was the first, the NEMO II was second, and now we’ve completed a third variant: the NEMO III. This picture was taken in 2004. 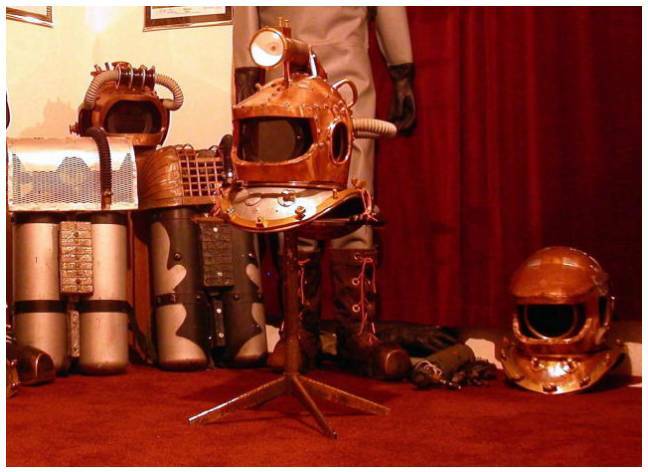 That’s the NAUTILUS DIVER behind the SCUBA tanks, and the NEMO II on the stand. Off to the right, on the floor, is the in-process NEMO III. It got sidelined for a number of reasons, and the NEMO II went to a Leagues Collector. 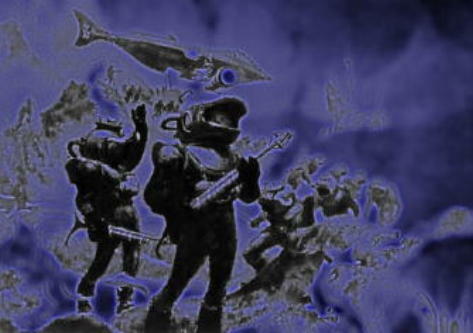 So, when Leon Lyons recently told me he wanted to feature my work in the upcoming reprint of his book HELMETS OF THE DEEP, there I was without a NEMO! That’s when I got busy finishing the NEMO III. 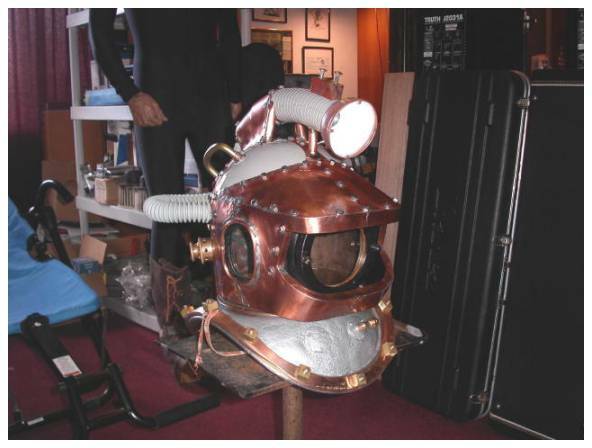 At first, the “face mask” for the NEMO III was about the same as the one on the NEMO II. But I decided to make a few changes, so I scrapped the one I made back in ’04 and started over. 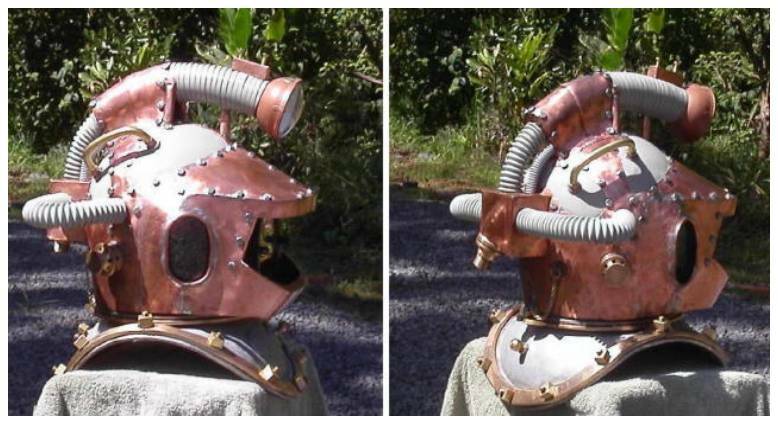 Here’s the helmet with most of the ornamental metalwork installed: including the “T-strap” crown plating and fittings for the faux air hoses. 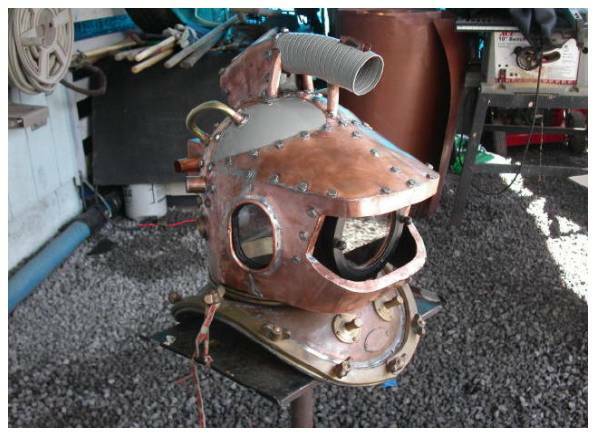 Here’s a look at the helmet with the metalwork pretty much finished. The headlamp tube is there, as are the grab handles, hex heads, gooseneck cover box, and so on. Everything’s looking dirty at this point, after the use of hammers, torches, and other tooling processes. Next, it gets scrubbed with lacquer thinner to remove residue; goes through an acid bath; and is then hand washed and polished with good old SOS pads and a lot of elbow grease. Here’s a look at the helmet on the workstand in our studio: amid shelves stacked with submarine parts, “Jake” mannequins, electric guitars, amplifiers, computers, etc. The metal’s been cleaned and shows a “too pretty” luster that (fortunately) will disappear as the patina forms with age. At this point, all the glass has been installed; the metalwork on the helmet itself is pretty much finished; and it’s time to move on to things like paint, the headlamp assembly, and the breastplate modifications. 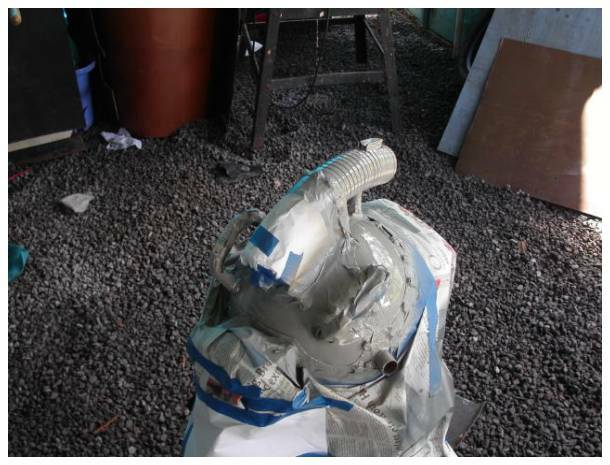 And here’s the helmet, with the masking tape and paper removed, sporting a fresh coat of gray. At this point in the process, I wipe the metalwork down with a thin coat of Neatsfoot oil and put it out in the sun to equalize and accelerate the patinization process. (Otherwise we end up with a “leopard spots” pattern where the oil from our fingertips produces brown blotches on the metal.) So here’s the NEMO III, all greased up and getting a beautiful Hawaiian sun tan. 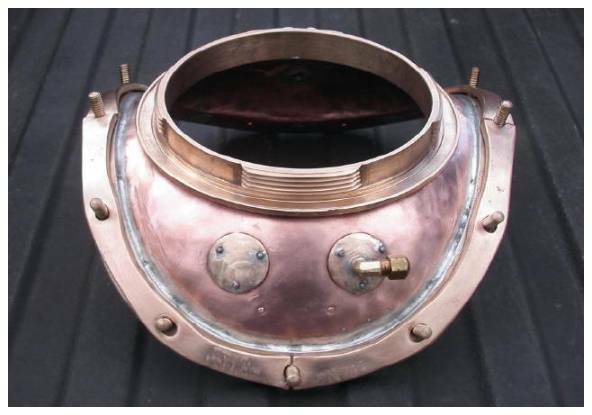 The breastplates on Disney’s LEAGUES rigs look silvery, but probably not because they were painted. 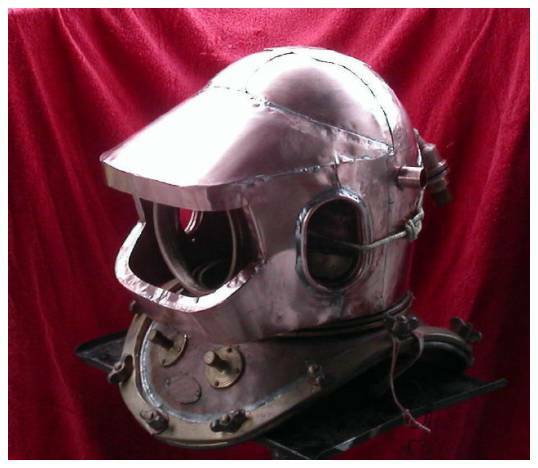 Traditionally, that finish seen on diving helmets and breastplates is produced by a process called “tinning”. I don’t have the facilities to tin my breastplates, so I simulate the effect with a special kind of paint that produces a very similar result. Here’s the finished breastplate, with all modifications complete, painting done, the gasket reinstalled, and a full set of 12 handmade square braile nuts. 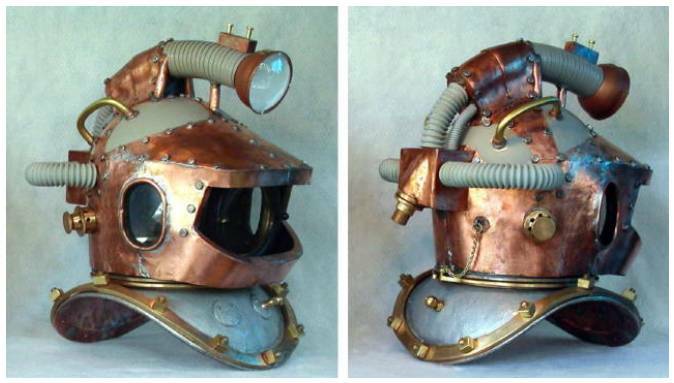 Another view of the helmet in the studio, but this time it’s complete right down to the headlamp. About this time I decided to make some small mods to the headlamp switch box, which was a little taller than the one on the Real NEMO. And here’s the finished helmet sitting out in the sun. At this point I had yet to trim the faux air hoses to the proper length, and they’re a bit longish. 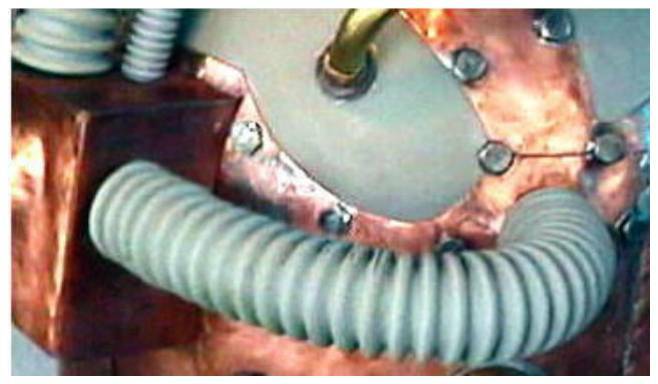 On the Real NEMO, the two side air hoses had 30 segments each, and the single vertical hose had 13 segments. 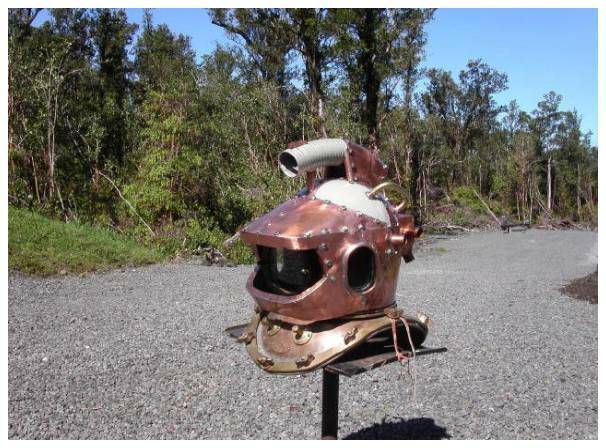 On surviving Leagues helmets, the original gray hoses rotted away long ago; and because that style of hose became obsolete, most authentic Disney helmets are now wearing gas mask hoses as a substitute. The hoses I use are exact reproductions of the originals: custom made on special order, relatively expensive, and very rare. I was recently advised that my stock may comprise last remaining cache of these hoses in the World. Another improvement on the NEMO III is the hex nut count. Most people don’t know it, but there are four hex nuts in back: around the plating concealed by the side air hoses, and adjacent to the goosneck air manifold cover box. I’ve never seen these four hex heads on anything but the Real NEMO until now. 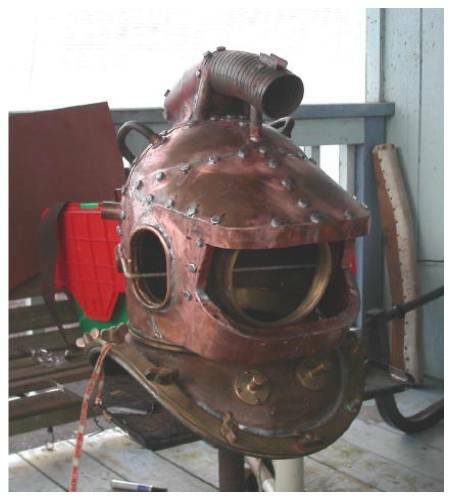 My first two Nemo helmets lacked this detail. The Disney Collectible Miniatures don’t have them, and the single hex head they do show in the center of the gooseneck box isn’t actually there on the Real NEMO. 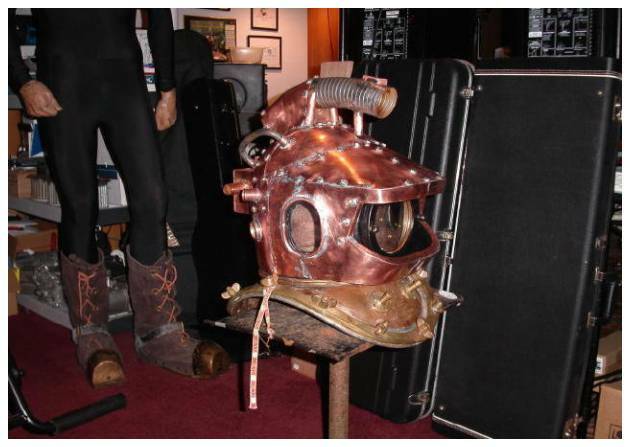 The little model of Captain Nemo (as shown on our MISCELLANEOUS IMAGES page) has one hex head alongside the box, but not all four. 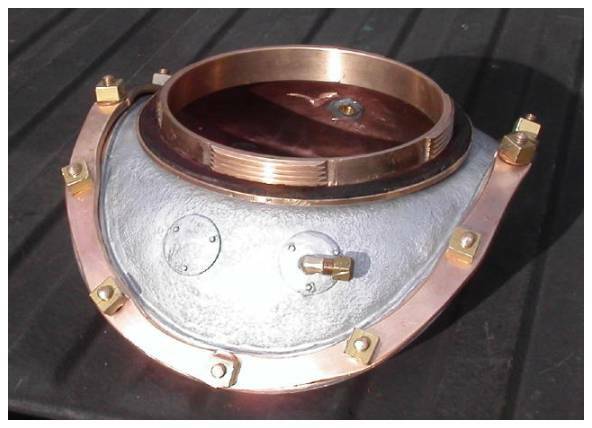 To the best of my knowledge, the NEMO III is the first Nemo Helmet replica, functional or otherwise, that includes this little-known detail; and this article is the first publication to disclose their existence. And here’s a last look at the finished NEMO III, with the rubber hoses trimmed to the proper length. There’s been some improvement to the headlamp bezel this time, too. Right now, the helmet is still (as Leon puts it) “too pretty”. In time, and after a few dives, it will develop a rich, dark patina and accumulate the “battle scars” that always come with age. All of that will only help make it look more like the Real NEMO.